The one thing about Pirates Week 2008 that everyone is talking about is the fireworks. It was definitely the best we've seen yet. I heard that big money was spent on the fireworks showdown on Saturday that lasted for about 10 minutes. How big? Oh about $100,000 big. Check out the video and you'll see why it's the talk of the town. We should be charging a whole lot more if 100k was your estimate! It was a whole lot less...a whole lot. The opener and the closer shows were combined due to Paloma the prior week. Thanks for the blog post. 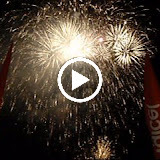 Visit us www.fireworkslimited.com where we should soon have a full pro video of the show online.